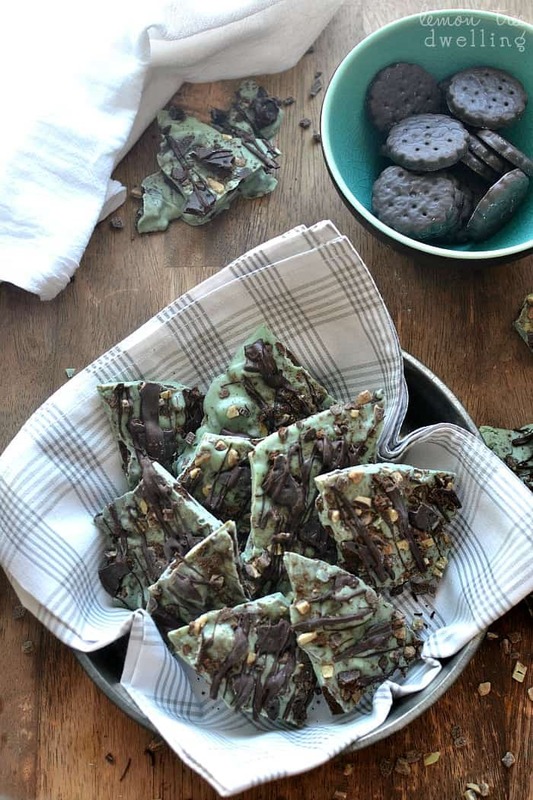 This Thin Mint Bark is what dreams are made out of. Stuffed with Thin Mint cookies, Andes Candies, and chocolate drizzle, this 5 minute dessert will be a huge hit! 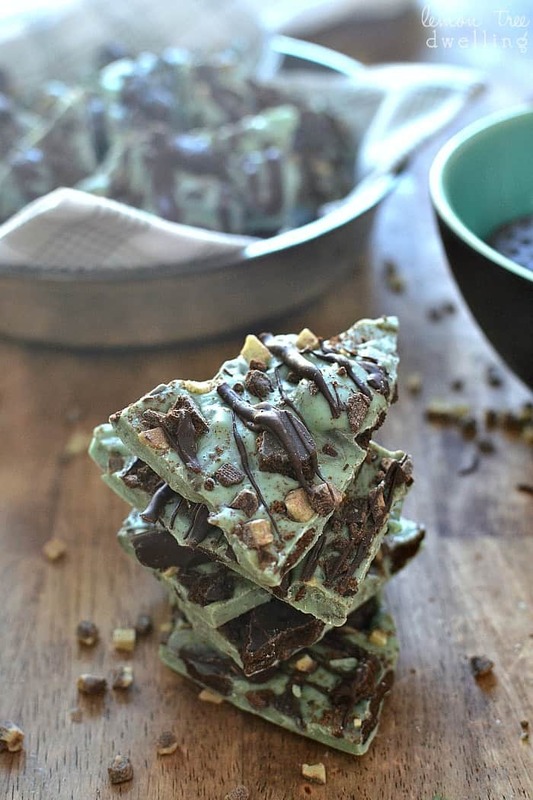 The perfect bark for the mint chocolate lover in all of us! The Girl Scout Cookies have finally arrived! And, just as planned, I’ve been having some fun with them. Of course, we haven’t delivered any of them to the neighbors and friends who bought them…..but at least we have them for ourselves! Ha! Were you a Girl Scout growing up? I never made it past the Brownies stage…..although I always wanted to be a Girl Scout! I loved the idea of it…..especially the cookie sales…..but I just couldn’t do it. It wasn’t for me! To be fair, I was never in the right troop. There were two troops for my grade level and we were placed in them based on where we lived. Well….we lived in a little pocket away from most of my friends, meaning I was never in the same troop as any of them! Which, for a kid, is nothing short of devastating. 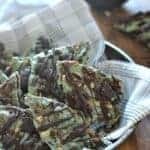 Thin Mint Bark – Mint Heaven! I stuck it out for two years and then decided to call it quits. I guess I just wasn’t meant to be a Girl Scout. And now that Greta is a Daisy, I wonder if I was meant to be a Girl Scout parent, either! I mean – if I can’t even deliver the cookies that were ordered – !?!? It makes you wonder, right? But. 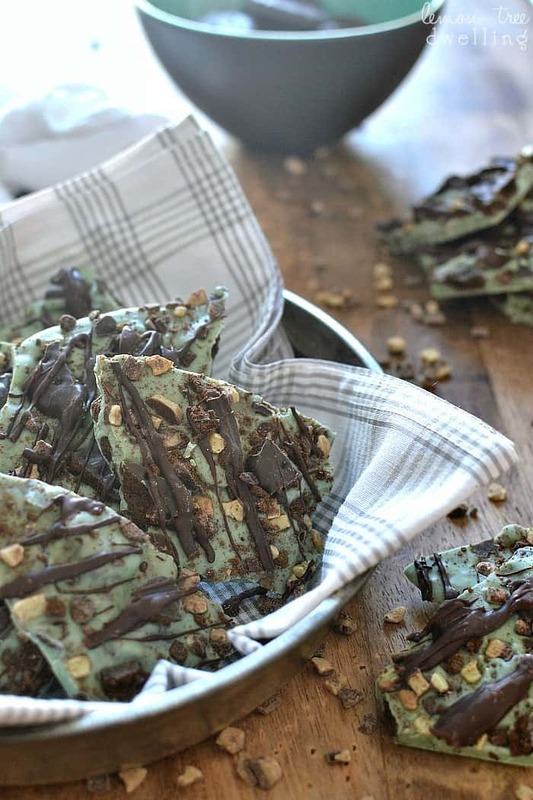 The one thing I have going for me is I can make a mean treat with the cookies…..like this Thin Mint Bark. No offense to the Girl Scouts, but this bark is even more delicious than the Thin Mints, themselves. If you haven’t bought any cookies yet, you’re going to want to! Just don’t buy them from us…..or you may never get them!!!! Melt chocolate in a medium saucepan over low heat, stirring constantly. Stir in green food coloring, one drop at a time, until desired color is achieved. 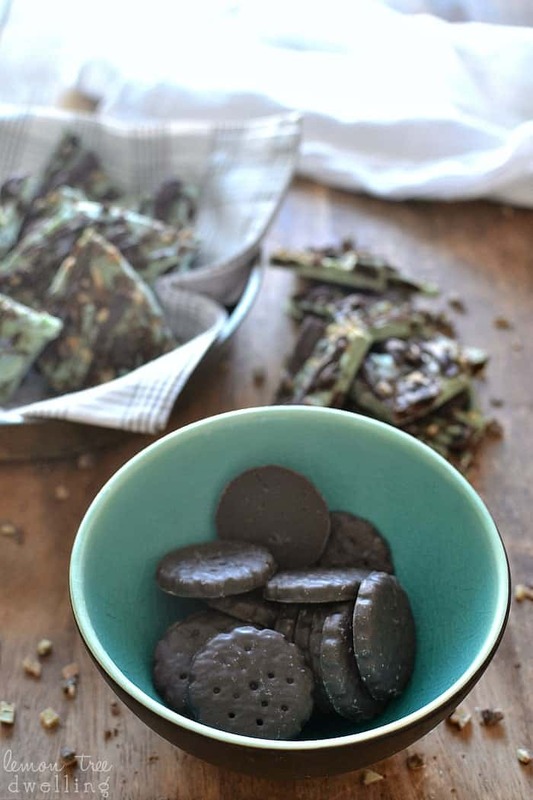 Crush Thin Mints into various sized pieces. Stir cookie pieces into melted chocolate, reserving some for the top. Spread melted chocolate mixture on to baking sheet lined with wax paper. Sprinkle with additional cookie pieces and Andes Mint Baking pieces. Melt chocolate chips and drizzle over the top. Let stand at room temperature or in refrigerator until hardened. These other mint recipes are sure to be a favorite too!! You had me at Thin Mint! 😉 This looks scrumptious, Cathy! Thanks for sharing!! I love Thin Mints, this recipe looks even better! I will definetely have to try it! I never made it past Brownies either – I was so upset the day I realized my sash wasn’t green, it was well, Brownie Brown! I did make it through one season of selling but the leaders actually took off with the money and there was the “Brownie scandal” in my town. I’m glad to see that was a rare incidence 🙂 Sydney wants to join in 2nd grade so we will see! Looks yummy! We just bought a case of Thin Mints today. Yes a case! My husband loves Thin Mints and they were offering a 10% discount for buying a case since it was the last week. I can’t pass up a good deal (or supporting a great organization). 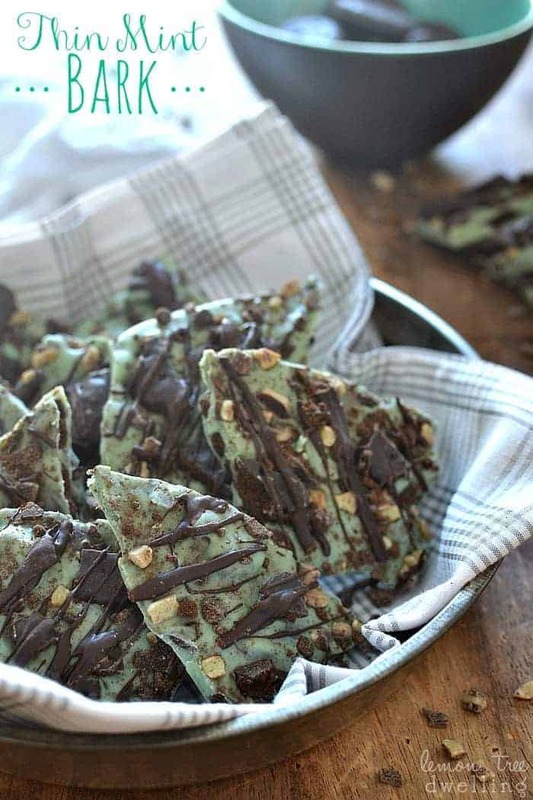 This thin mint bark is so creative, Cathy! I love the pretty green color and minty flavor. So festive and delcious to munch on! Okay so first, I want all your girl scout cookies. And second I want this bark! Your recipes are always so simple but creative and super beautiful Cathy! Love everything about this. What is the unit of measure used in this recipe? I Dom not understand what c. Means?